HYL process is designed for the conversion of iron ore (pellet/lump ore) into metallic iron, by the use of reducing gases in a solid-gas moving bed reactor. Oxygen (O2) is removed from the iron ore by chemical reactions based on hydrogen (H2) and carbon monoxide (CO) for the production of highly metallized direct reduced iron (DRI)/hot briquetted iron (HBI). HYL process is presently marketed under ‘Energiron’ trademark. HYL process for direct reduction of iron ore was the fruition of research efforts begun by Hojalata y L.mina, S.A. (later known as Hylsa), at the beginning of the 1950s. After the initial evaluation of the concept, it was decided to install a process using a tunnel furnace and several runs were undertaken. The first batch was made by using an ancient furnace (which had been built to heat plate) on the 5th of July, 1950. One part of crushed ore of size ranging from 12 mm to 25 mm was mixed with 40 % coke breeze and 15 % limestone of the same granulometry as the ore. This mixture was put into clay crucibles and into 2 iron pipes, each one with a diameter of 100 mm and a length of 1 meter. 20 kg of good quality of DRI was produced. The first gas based plant, with a design capacity of 50 tons per day, was unable to reach acceptable levels of metallization. During the 18 months of its operation, it underwent several changes, including the installation of a natural gas reformer with the object of improving the reducing gas. Finally, its operation was suspended during early 1955. After this discouraging attempt, several experiments were carried out and a pilot plant was assembled to put the new ideas to the test. When this pilot plant was put into operation, it started to successfully produce good quality reduced iron at a rate of 30 tons per day. It soon reached a systematic production of almost 60 tons daily. With the successful production of direct reduced iron with the gas-based HYL direct reduction process, studies were begun for the design of the first commercial plant with a daily capacity of 230 tons of DRI. The first industrial scale direct reduction plant was put into operation on December 5, 1957. The Hylsa Monterrey 1-M plant, a fixed-bed reactor or batch process, had an initial capacity of 75,000 tons per year of DRI. It remained in continuous operation until 1991, just short of a full 35 years of production. In 1978, the American Society for Metals designated Hylsa’ HYL Process Plant 1-M a historical landmark for having been the first successful industrial implementation of direct reduced ironmaking technology. However, the competitiveness of this technology was limited due to its batch nature. By the end of 1970, world total DRI output for 1970 reached 790,000 tons, 680,000 tons of which was produced in HYL process plants. However, it was foreseen by HYL that the competitiveness of this technology would be limited due to its batch nature. For this reason, a research program was initiated in 1967 to develop a continuous (moving bed) process, starting the first industrial plant in May, 1980 in Hylsa Monterrey, Mexico, 23 years after the success of its first HYL plant. The new continuous shaft furnace process was called HYL III. The new process concept led to higher plant productivity, superior DRI quality, lower energy consumption and a simpler plant operation. The name HYL III was chosen, representing the third generation of HYL technology. The second generation (HYL II) was basically a modification of the original fixed-bed process designed to improve efficiency and reduce natural gas consumption. During this development stage of the process two important modifications were made namely (i) use of high temperature alloy tube in the reducing gas reheating furnace, which had permitted heating the gas to the higher temperature, and (ii) reduction in the number of heating furnace from the original four units to two units. In the HYL II process, reducing gas (rich in CO and H2) was generated, typically by nickel based catalytic reforming. However, the HYL II process was never commercialized since the appearance of the HYL III process offered significant advantages. Since then, several improvements have been incorporated in the HYL III moving bed process. In 1986 a CO2 removal system was incorporated in the reducing gas circuit, which resulted in significant improvements in productivity, energy consumption, and DRI quality. The reformed gas consumption was decreased by around 50 % and the shaft furnace productivity was also increased by around 50 %. In 1995, the partial combustion technology was incorporated in HYL plants by injecting O2 at the transfer line between the reducing gas heater and the inlet of shaft furnace. This scheme allowed an important increase in the reducing gas temperature, as well as in-situ reforming. This decreased the reformed gas consumption by around 25 % and increased the productivity of the shaft furnace. In 1988 the total natural gas feed and O2 injection to the shaft furnace (reduction reactor) led to the ‘HYL self-reforming scheme’, where the reformed gas make-up was reduced to zero. This reformer less scheme was named as HYL ZR process and was applied successfully in the Hylsa 4M plant in April, 1998, and in the Hylsa 3M5 plant in July, 2001. Use of coating of pellet/lump ores for direct reduction was introduced in 1988. Pneumatic transportation system (Hytemp technology) and hot DRI feeding to the EAF was introduced in 1993. During 1994 HYL started producing high carbon (C) DRI with 3 % to 5 % C content. World’s first dual-discharge (DRI and HBI) plant design was put into operation during 1997. Use of 100 % lump ore charge was done successfully on a routine basis during the year 2000. During 2001 micro module (200,000 tons per year) plant based on HYL ZR (zero reformer) reformer less technology was introduced. HYL ZR process plants based on coal gasification and coke oven gas (COG) were introduced. Also, DR plant with a design capacity of 2.5 million tons per year in a single module was supplied during the year. Between micro module and the single module of capacity 2.5 million tons per year, there are available modules with the annual capacities of 500,000 tons, 800,000 tons, 1.2 million tons and 1.6 million tons. The initial development work was done by Hylsa. In 1977, Hylsa set up a new operating division (HYL technologies) for the purpose of formally developing and commercializing the direct reduction technologies. In 2005, Techint Technologies acquired HYL technologies. Later this division was called Tenova HYL. In 2006, a strategic alliance was formed by Tenova and Danieli for the design and construction of gas-based DR plants under the new ‘Energiron’ trademark. Energiron is the innovative HYL direct reduction technology jointly developed by Tenova and Danieli, and whose name derives from the unique DRI product which distinguishes this technology from other available processes. HYL direct reduction plant consists of mainly the following plant and equipment along with their characteristic features. A reduction shaft furnace which holds the moving bed. This shaft furnace has a system for charging iron burden and a product discharge system. A reducing gas circuit, consisting of a process gas heater, top gas heat recuperator, top gas quenching/scrubbing unit, reducing gas recycle compressor, humidification tower and knock out drums. Operation of the furnace is carried out with minimum natural gas and water consumption, as well as O2 injection. The product discharge system can have (i) a cooler for the cold DRI production, (ii) hot briquetting machine for the production of HBI, and/or (iii) Hytemp pneumatic transport system to transfer hot DRI directly from the shaft furnace to the electric arc furnace (EAF). An external cooling gas circuit, consisting of a quenching/scrubbing unit and cooling gas recycle compressor. An adsorption system, based on PSA (pressure swing adsorption), for carbon dioxide (CO2) removal from the reducing gas stream. Iron ore handling equipment including iron ore surge bin, transfer conveyors, screening station, pellets coating system, feeding conveyor, along with sampling and weighing units. DRI handling system consisting of conveyors and related equipment for the transport of cold DRI. Cooling tower along with filtering equipment and pumps. Process cooling water system, based on closed circuit to minimize water consumption, with clarifier and settling ponds. A process control and instrumentation system, using microprocessor-based distributed control. Electrical substation, electric motors and lighting. Inert gas system normally based on nitrogen (N2) gas. 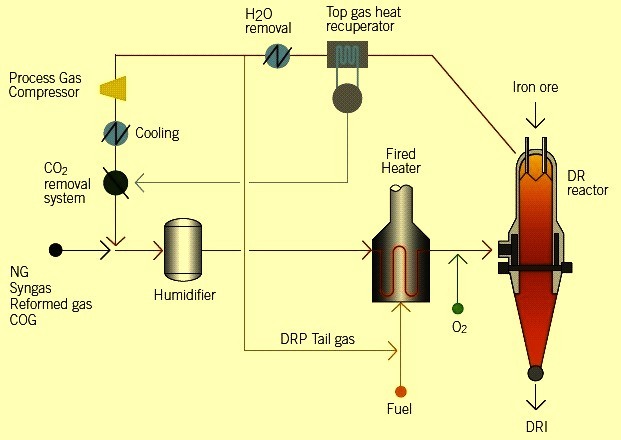 Energiron direct reduction process (HYL process) uses a shaft reduction furnace to produce DRI. It is designed to convert iron pellet/lump ore into metallic iron by the use of reducing gases in a solid-gas moving bed shaft furnace. O2 is removed from the iron ore by chemical reactions based on H2 and CO, for the production of highly metallized DRI. The schematic process flow of the direct reduction process is shown in Fig 1. The main characteristics of the HYL process consists of (i) utilization of H2 rich reducing gases with H2 to CO ratio of more than 4, (ii) high reduction temperature usually more than 930 deg C, and (iii) high operating pressure usually in the range of 5 kg/sq cm to 8 kg/sq cm. The higher operating pressure has many characteristics which include (i) lower gas velocity, (ii) lower dragging force, (iii) lesser dust carry over, (iv) lower consumption of iron bearing materials, (v) higher ratio of plant capacity/size, and (vi) lower power consumption due to lower compression factor. High operating pressure in the shaft furnace also results into a high furnace productivity which is around 9 tons per hour per square meter area. The process is flexible to produce three different product forms, depending on the specific requirements of each user. The three forms of DRI are cold DRI, HBI or hot DRI (‘Hytemp’ iron). Cold DRI discharge is normally used in an adjacent steel melt shop close to the direct reduction plant. It can also be shipped and exported, provided some procedures are followed and precautions are taken to avoid reoxidation. HBI is the DRI which is discharged hot, briquetted, and then cooled. It is a merchant product usually meant for overseas export. Hytemp iron is the hot discharged DRI, pneumatically transported from the DR plant to an adjacent steel melt shop for its direct feed in the electric arc furnace (EAF). Discharge options for the three products as well the flow scheme for the Hytemp iron is shown in Fig 2. The basic process configuration is characterized by its flexibility to process different gas analysis. Reducing gases can be generated (i) directly, by in-situ reforming of natural gas inside the shaft furnace, (ii) in an external natural gas/steam reformer, (iii) as syngas from gasification of fossil fuels, biomass, etc., (iv) from exhaust gas of smelting reduction process such as Corex, or (v) from coke oven gas (COG) sources. In all the cases, the process configuration corresponds to the same basic zero reformer schemes, adjusting the relative sizes of equipment for the particular application. For both the in-situ and steam reforming alternatives, natural gas analysis (heavy hydro-carbons content) is not a limiting factor. The ‘make up’ gas can be of any mixture of H2, CO, CO2 and hydrocarbons in any proportion. One of the in-built characteristics of the Energiron process flow which has high environmental importance is the selective elimination of the byproducts generated from the reduction process namely water (H2O) and CO2. These byproducts are eliminated through top gas scrubbing and CO2 removal systems, respectively. The selective removal of H2O and CO2 optimizes make-up requirements. Water produced during the reduction process is condensed and removed from the gas stream and most of the dust carried with the gas is also separated. Scrubbed gas is then passed through the process gas recycle compressor, where its pressure is increased. Compressed gas, after being sent to the CO2 removal unit, is mixed with the natural gas make-up, thus closing the reducing gas circuit. A key factor of the HYL process is its pressurized operation. The use of O2 depends on hydrocarbons content. DRI metallization and C are controlled independently. Three types of chemical reactions take place during the process. They are (i) partial oxidation and reforming reactions, (ii) reduction reactions, and (iii) carburizing reactions. These reactions are given below. The reforming of natural gas requires (i) a certain level of oxidants (H2O and CO2), which have to be carefully controlled, (ii) a high temperature, as a result of partial combustion, and (iii) an active catalyst, which is provided by the metallic iron units from the iron ore already reduced. The oxidants produced by the reduction reactions are partially consumed by the reforming reactions. In this manner, once in contact with the solid material inside the shaft furnace, further methane reforming takes place in-situ due to the catalytic effect of metallic iron (Fe). Under these conditions, the methane is always in contact with new catalyst (metallic Fe in DRI) since DRI is continuously being removed from the shaft furnace. Therefore, in-situ reducing gas generation and reduction take place in a highly efficient environment. This reforming process is highly endothermic and it continues up to the point where the temperature is still high enough. Once the temperature drops below a certain level, in-situ reforming does not occur and only iron ore reduction proceeds. Most of the DRI carburization takes place by cracking of methane (CH4) to produce iron carbide (Fe3C). Energiron ZR process has decreased the size and improved the efficiency of the HYL direct reduction plants. Reducing gases are generated in-situ in the reduction shaft furnace, by feeding natural gas as make-up to the reducing gas circuit and injection of the O2 at the shaft furnace inlet. In the process, optimum reduction efficiency is achieved, since the reducing gases are generated in the reduction section. Because of this, an external reducing gas reformer is not required. Normally, the overall energy efficiency of the ZR process is above 80 %, which is optimized by the in-situ reforming inside the shaft furnace. The product takes most of the energy supplied to the process, with minimum energy losses to the atmosphere. The impact on plant size of eliminating the external gas reformer is significant. For a capacity of 1 million tons per year, the area requirement reduces by around 60 %. This also facilitates locating the DR plant adjacent to the steel melt shop. Additional advantage of ZR process is the flexibility for the carburization of DRI, which allows attaining of C levels up to 5 %. This is because of the improved carburizing potential of the gases inside the shaft, which allow for the production primarily of Fe3C. DRI with a high content of Fe3C has a much lower reactivity than the normal DRI since higher heat of dissociation is needed for Fe3C. Energiron process can also use the conventional reforming of natural gas by steam, which has characterized the HYL process since a long time. Other gases such as H2, syngas obtained from gasification of coal, pet coke and similar fossil fuels, and coke oven gas (COG), among others, are also possible sources of reducing gas, depending on the specific situation and availability of the gas. This flexibility is available, since the Energiron ZR process is independent of the reducing gas source, with no requirement to recirculate gases back to a reformer to complete the process chemistry loop. Hot reducing gases are fed inside the shaft furnace at the reduction zone. These gases flow upward counter-current to the iron burden moving bed. The gas distribution is uniform and there is a high degree of direct contact between gas and solids. The exhaust gas (top gas) leaves the shaft furnace at around 400 deg C and passes through the top gas heat recuperator, where the heat of the gas is recovered to produce steam. Alternatively, the heat of the exhaust gas can be utilized to preheat the reducing gas stream, and then the exhaust gas can be cooled through the quenching/ scrubbing process. For cold DRI, a cooling gas is fed to the lower conical part of the shaft furnace at around 40 deg C, flowing upward counter-current to the DRI moving bed. The gas distribution is uniform and there is a high degree of direct contact between the gas and solid, without physical restrictions to the flow of solids or gases inside the furnace. Hot DRI is discharged by means of the rotary valve of the shaft furnace, through the diverter valve, which delivers material either to the Hytemp system or to an alternative external cooler (for cold DRI production). The pneumatic transport is normally carried out at the same rate as the shaft furnace production rate. For the production of HBI, hot DRI is continuously discharged at a temperature which is more than 700 deg C to the hot briquetting machines arranged below. The HBI is cooled in vibrating cooling conveyors using cooling water and then discharged to the HBI transport conveyor. The Hytemp iron uses pneumatic system for the transport of hot DRI to the electric arc furnace (EAF). It uses nitrogen (N2) or process gas as the transport gas. It is an environmentally friendly process since the DRI is kept enclosed from the time of discharge from the reduction shaft furnace to the time it is discharged into the EAF. The system has the flexibility for feeding two EAFs from single shaft furnace. At the bottom of the shaft furnace, DRI is discharged to the pneumatic transport system where the hot gas flow coming from the gas heater is circulated and is used to transport DRI. To avoid degradation, the DRI is transported by pressure build-up rather than velocity of the gas. When hot DRI reaches the storage bins on top of the EAF the DRI and gases are separated. The gas is sent to a scrubber for cleaning and cooling. It is then compressed and heated for recycling. Before entering the gas heater, make-up gas is added to compensate for losses when separating DRI from the transport gas. Hot DRI separated from the transport gas is sent to a transition bin in order to go from the pressure of the transport system to atmospheric pressure. From the transition bin DRI goes into the storage bin to be fed into the EAF by gravity. Hot DRI can also be sent from the shaft furnace to an external cooler when the steel melting shop is not ready to use or store hot DRI. The external cooler normally has the capacity to cool entire DRI production. In a typical HYL III process configuration, the sensible heat of the hot reformed gas and flue gases from the reformer is used mainly for steam generation. Steam requirements for the DRI process plant are for two end-users namely (i) steam for reforming, and (ii) exhaust steam for the CO2 absorption system in the reduction circuit. The amount and pressure of the steam produced is specified in order to attain an optimum thermal and mechanical balance of the plant. Normally, the steam is produced at high pressure (63 kg/sq cm), in order to take maximum advantage of the steam enthalpy for electricity generation in a single high-efficiency turbo generator, before being used for reforming and in the CO2 stripper re-boiler. In this way the total electric power requirement for the plant can be generated within the plant. The capacity of the turbo generator is around 90 kWh/ton in case of cold discharge or 105 kWh/ton HBI in case of hot discharge which is sufficient to meet the need the total electricity requirement of the plant. One important characteristic of the Energiron direct reduction plant is the possibility to design the process for a zero make-up water requirement. This is possible mainly because water is a by-product of the reduction reaction since it is condensed and removed from the gas stream. As a consequence, with the adoption of a closed-circuit water system based on the use of water heat exchangers instead of conventional cooling towers, there is no need for fresh make-up water and actually a small stream of water is left available at battery limit. The typical characteristics of the product of the Energiron ZR process are given in Tab 1. The typical operating parameters and the specific consumptions for the Energiron ZR process are given in Tab 2. The typical emissions from the Energiron ZR process are given in Tab 3.